NASA has completed its 30-day lunar laser mission which confirmed that the possibility of expanding broadband capabilities in space using laser communications is as bright as expected. Dream of travelling to the moon? 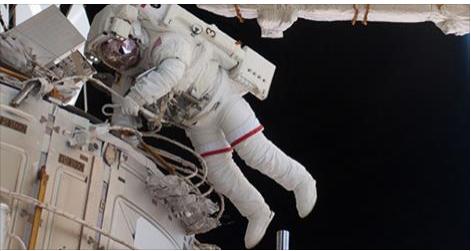 You may want to think otherwise because the human body is not designed for space travel, researchers say. Urine is typically considered something to get rid of. But urine is largely water, and that’s a valuable resource in space. If a new process can be successfully scaled up from recent lab tests, future space travelers could more efficiently recycle their own urine to reclaim its water and make a little electrical power to boot. An artificial leaf converts water and light to oxygen, and that's good news for road-tripping to places beyond Earth. The Rosetta landing: Could the mysterious comet hold clues to the origin of life? Rosetta represents not only the first attempt at a soft-landing onto the surface of a comet, but also the first time they will get a chance to touch and and taste one of these ancient objects believed to be remnants from the time the solar system was born. The anchoring harpoons did not fire, and so they are not anchoring the lander to the surface. "We still do not fully understand what has happened." When things don't work properly, humans usually find clever solutions beyond expectations. Remember Hubble: it was a drama as images were blury... solutions found gave us improved images far beyond the initial project; without the problems that were encountered, we wouldn't have discovered such wonders. So many inventions go beyond imagination, following mistakes (blotting paper, penicillin, X-Rays), big unexpected problems (Hubble), etc. Like in sports where athlets have to be mentally trained to ask for mad results, and dare, and overcome there fear, "normal" imagination of projects are never as ambitious as solutions to failed experience. Negative outcome is not a problem, it's an opportunity so taht people can say "we don't have anything to lose". The hunt for lost lander Philae is gaining steam. The hunt for Rosetta's lost lander Philae is gaining steam as scientists pore over images from above the comet that may help reveal its final location. Philae was sent all the way to a comet to do chemistry that can explain the origin of life. But what did it actually do for 60 hours? COMET LANDER SNIFFS ORGANIC MOLECULES IN ATMOSPHERE: The Philae comet-lander has found traces of organic molecules on the surface of the comet 67P. What exactly did they find? I see that we know more about comets. what about the universe origin ? I am looking forward to knowing that. are you ? How to see what happened before light appeared (ie before 380,000 years after BB)? There're articles speaking about 400Myears but I guess they're mistaken (eg NASA LOL http://jwst.nasa.gov/firstlight.html ). It's 380,000 years against 400,000,000 years. What the gell do you mean? Sound in vacuum?? Sorry for that mistake ! I am totally confused with huge numbers. The Rosetta spacecraft and its Philae lander have a lot to teach scientists about what Comet 67P/Churyumov-Gerasimenko looks like, is composed of, and even what it smells like, but what does the comet sound like? The day before Philae made history by landing on the surface of the comet, ESA released an audio clip of 67P/C-G singing. Unfortunately, its song is creepy as hell and sounds a lot like Predator, the alien that tried to kill Arnold Schwarzenegger. Gérard they have found what the comet smells like and also what it sounds like. You can listen for yourself ! Ok human ear can't hear it and ESA scientists altered the frequency of the comet's song into human hearing range. What you posted provided me with a Briton music. I got another YouTube record. As you could read, teh sound cannot be heard but was re-created. Yes i have first posted the wrong video and I had to cancel it to post the right one which I find fascinating ! The comet seems to be emitting a ‘song’ in the form of oscillations in the magnetic field in the comet’s environment. It is being sung at 40-50 millihertz, far below human hearing, which typically picks up sound between 20 Hz and 20 kHz. To make the music audible to the human ear, the frequencies have been increased by a factor of about 10,000. Of course to make the music audible to the human ear, the frequencies have been increased by a factor of about 10.000. The scientists are excited because they didn't expect that. A new super-thin film from Stanford University can keep buildings cooler and save energy by bouncing 97% of the sun's rays away. Stanford researchers suggest a unique place to store excess heat -- the coldness of outer space -- which could help keep buildings cooler and help save energy. What do the holidays look like from outer space? Pretty bright! According to NASA, the intensity of light coming from urban areas in the US increases by 20% during December. Happy holidays! Explore stunning celestial views from Hubble, the space telescope that expanded the frontiers of human knowledge. Pictures from the space telescope have dazzled us for 25 years. 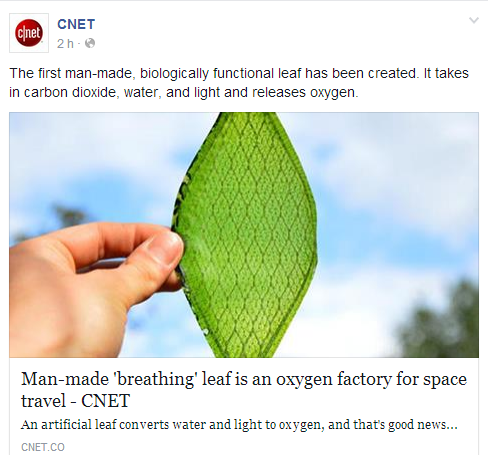 (New) Artificial Leaf Capable Of Producing Oxygen Could Make Living In Space A Reality! The man-made “plant” can create endless oxygen using light and water!